Launch-day Set Piece: Smirking biographer John Roughan downplayed the political bias behind the book project on TV One‘s “Breakfast” news show. 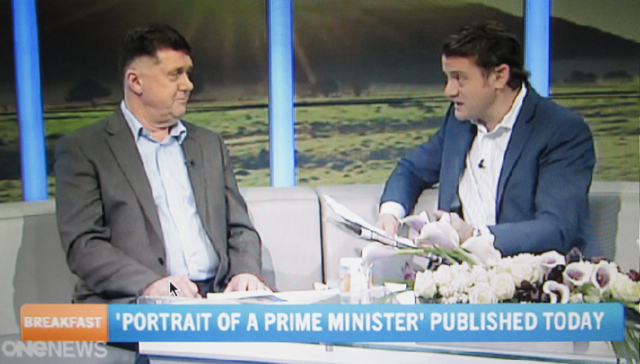 During an interview with the biographer of an ‘unauthorized’ bio on New Zealand’s prime minister John Key, “Breakfast” programme (June 26, 2014) host Rawdon Christie inoculated the key weakness of the book project: its inherent bias. Inoculation is a public relations (PR) tactic where the weakness of the matter at hand is acknowledged, then quickly brushed aside. The intention is that the news audience will think nothing more of it, satisfied that there is nothing under-handed to see, as the documentary The Hollow Men showed. The One News television broadcaster asked biographer John Roughan, a senior columnist for the corporately-biased New Zealand Herald, if he expected there would be criticism of the timing of the biography, given there is a general election in September. Roughan downplayed the political strategy, essentially saying it was an economically motivated one. “We wanted to get the book out before an election, ’cause elections are so risky, anything can happen. And who knows where he’ll be in six months time. Right now, we think there’s an interest in him, there’s a market for knowing more about John Key and his life,” Roughan said. While asking the biographer if there were a political conspiracy behind the timing of the book, Christie feigned to stammer as he asked the question. “Yeah, but, ah, this isn’t some sort of, aah, political, aah, sort of a, conspiracy to try and give him some PR? Mind you, does he need the extra PR right now?” asked Christie smirking his way through the ‘stammering ritual’. “No, he doesn’t,” said biographer John Roughan. This part of the interview was the only place where the One News “Breakfast” host stammered in his performance. The ‘stammering ritual’ creates the effect that it’s an off-the-cuff question, to subtly suggest that it was not prepared and shared with the guest prior to the interview . Propaganda as Portrait: The biography was inoculated before book stores opened nationwide. Conspiracies are secret agreements for political gain to the detriment of society. They can occur even where the projects are well-publicized. The vital point is the intent behind the project is hidden. Given that the Key government is advancing a Shock Doctrine ‘free market’ economic framework, such as nationwide state-housing evictions amid a ‘strategic sabotage of society’ to widen inequality, those key insiders behind this book are seeking to hide the purpose of their project, while ‘painting’ a propagandist portrait of John Key. Christie’s ‘tell’ that he has just ‘successfully’ pulled off this vital ‘inoculation ritual’, is his “Umm” as he moves on. It is an unintentional stammer that P.R.-trained professionals and politicians do as they pass through the tricky bit, like when they try to pull-off a rehearsed ‘joke-humour ritual’, and say an involuntary ‘umm’ due to their nervousness. In a parallel universe to the Media Propaganda-Public Relations-Psychological Operations State-Corporate Complex, an ‘unauthorized biography’ means a work about the life of a person that is written without their help. ‘Help’ is a word that is best friends with the word ‘cooperation’. 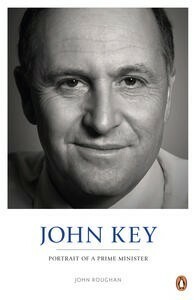 Yet, as the biographer himself acknowledges, John Key provided several lengthy interviews for the book project! Best Friends Tweet: Snoopman News explains to One News that the difference between (un)authorized in a biography project is to do with how friendly help is cooperation. Whilst at face value there is nothing wrong with writing a biased biography that is promoted as an opportunity to make the most of ‘market interest’, there is something deeply wrong with two major media outlets colluding to downplay the inherent political strategy in the lead up to the September 20 nationwide election. It is also disturbing given it occurs amid the continued application of the Shock Doctrine, a stealthy project that is used to mete-out a ‘strategic sabotage of society’, while the dominant coalitions of capitalists accumulate more power through outsized economic gain made by exploiting engineered economic crises. Furthermore, it is disturbing because this unacknowledged application of the Shock Doctrine is a conspiracy that has involved both National and Labour-led governments since 1984. It relies on mass populaces everywhere not knowing about it, as Canadian journalist Naomi Klein states in the documentary, The Shock Doctrine. By day, Snoopman works undercover as an ordinary mortal, editing news at a television station. By night, Snoopman researches the wicked deeds of the powerful, and is Editor-in-Chief at Snoopman News. (See Snoopman News for pictures and sourced references). Barry, Alistair. (1995). Someone Else’s Country. [Motion Picture]. Vanguard Films. Retrieved from http://www.nzonscreen.com/title/someone-elses-country-1996; Barry, Alistair. (2002). In a Land of Plenty. [Motion Picture]. Vanguard Films. Retrieved from http://www.nzonscreen.com/title/in-a-land-of-plenty-2002 [In 5-part video segments]. When someone is in such synchronicity of thought with us it can be frightening? This week it is absolutely vindicating.. I will doubtless still dream 1984 but at least I will rest easy knowing I am not the only one..
Zappaesquely, I like that. Pull the curtains down, like stop it do you mean, and in NZ?